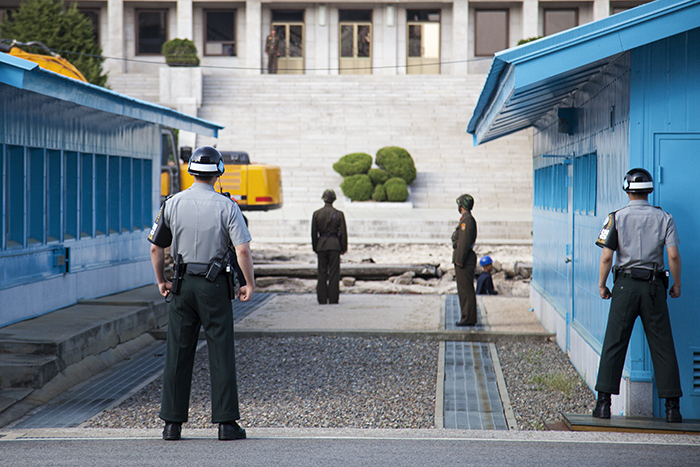 One of the highlights of our Korean sojourn was definitely the DMZ tour that we took through Koridoor. Honestly, I mostly wanted to see the JSA because of the Korean film of the same name. But the tour turned out to be so much more educational and entertaining. 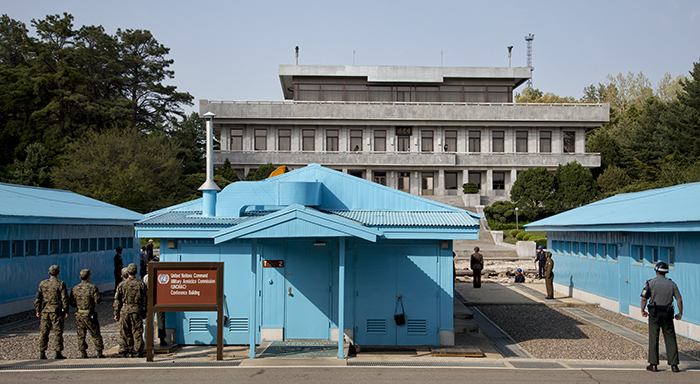 If you visit Korea, I highly recommend Koridoor's DMZ tour. 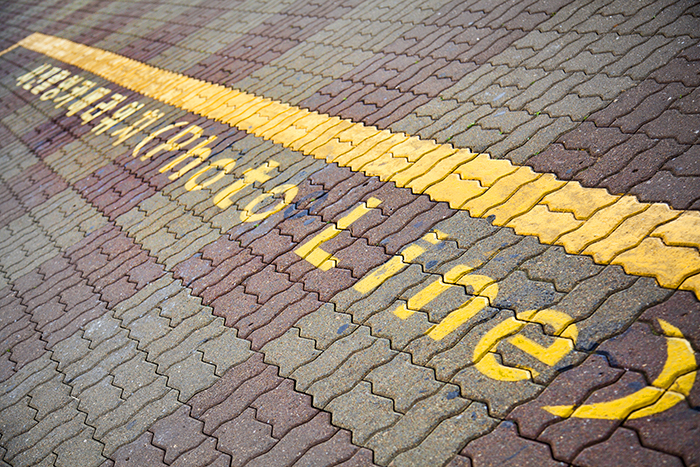 The MDL is the military demarcation line that separates the two Koreas. Technically, the two sides are still at war, but they temporarily agreed to stop fighting in 1953 when the armistice was signed. 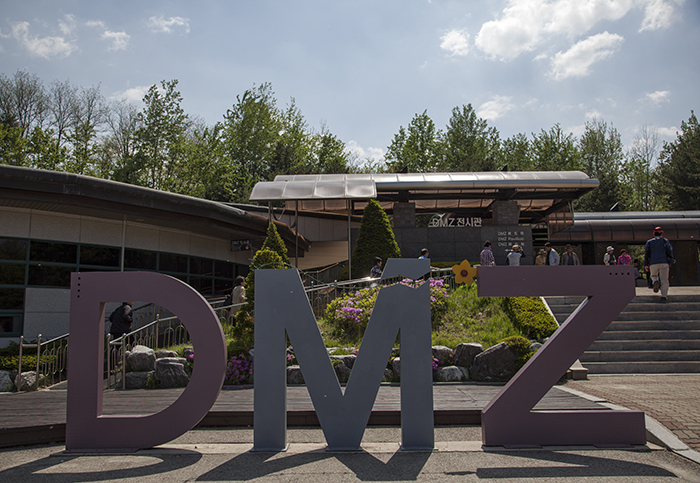 The DMZ or demilitarized zone is the 2km buffer on each side of the MDL. In other words, the DMZ is about 4km wide. 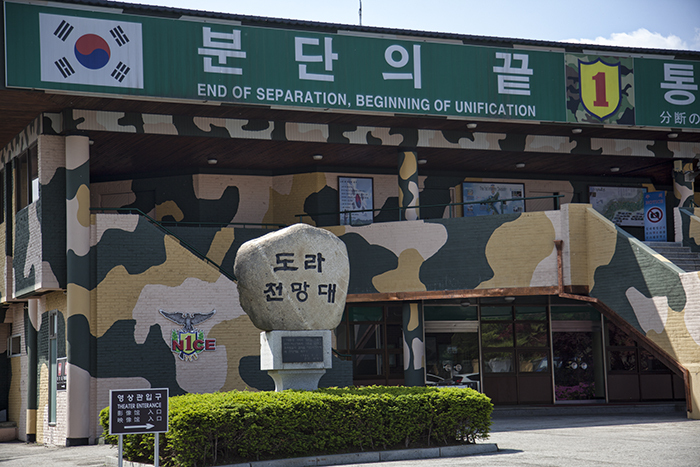 There aren't supposed to be any military installations within the DMZ, hence the name demilitarized zone. 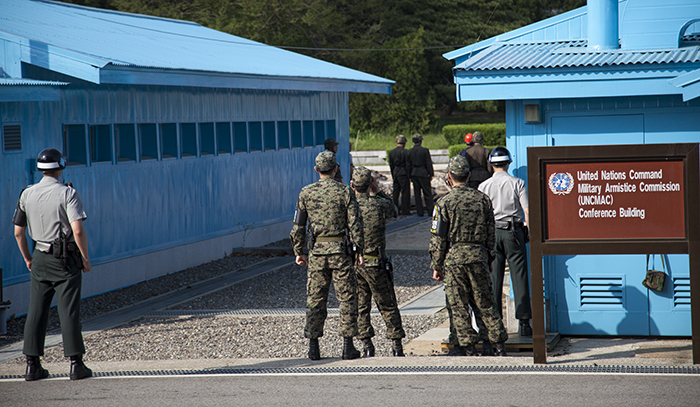 The JSA or Joint Security Area is the one place along the DMZ where you can see both KPA and ROK soldiers standing face to face (more or less). They used to be able to roam freely within the JSA, but then the "axe murder incident" ended that. Now, the soldiers can only stay on their side of the MDL. KPA is the Korean People's Army. North Korean soldiers are known as KPA soldiers. ROK is the Republic of Korea. South Korean soldiers are known as ROK soldiers. (A "rock soldier" just sounds so much cooler). The Koridoor tour starts off at the USO office at Camp Kim in Seoul. From there, the bus takes you along the Han River. 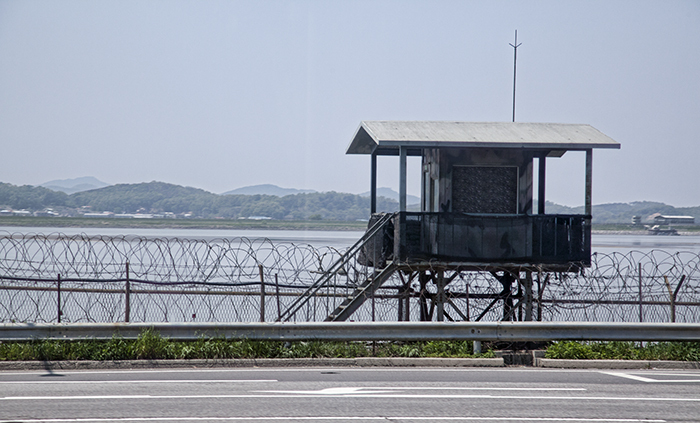 Soon, you start to see a barbed wire fence with frequent guard posts and you are quickly reminded how close Seoul is to North Korea. Our first stop was the DMZ museum, right by the so-called Third Infiltration Tunnel. (It's the third tunnel that was discovered). 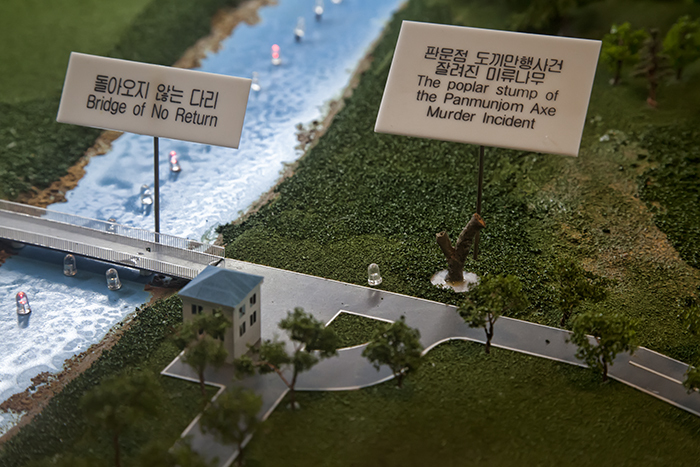 The museum has some useful models of the DMZ and JSA area. This shows the site of the infamous axe murder incident. Basically, two US Army soldiers were trying to cut down a tree to improve visibility when they were attacked and killed by KPA soldiers. We didn't get out of the bus when we drove through this area, so this photo works better than anything I got of the real place. There's also a funny story about Bill Clinton and the Bridge of No Return. I'll save it for the end of the post. 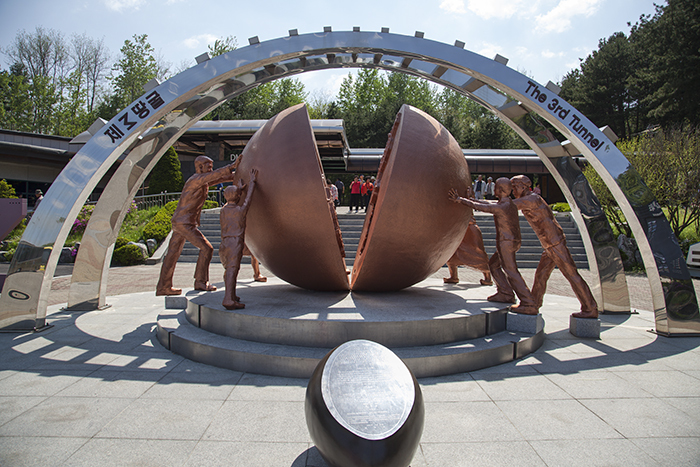 Everywhere you go in the DMZ area, there is this overall theme of hope. This is clearly illustrated in the sculpture below. The people of the north and south are seen trying to reunify their country. Next on our itinerary was a walk down the Third Infiltration Tunnel. Unfortunately, no photos are allowed. (Don't tell anyone about this one). 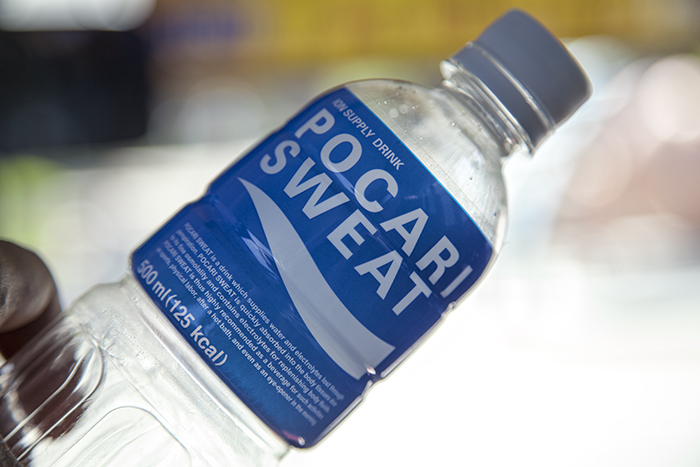 So I present to you Pocari Sweat. It's a Korean electrolyte drink that I had seen around but never wanted to try—the word "sweat" doesn't exactly sound appealing. In reality, the drink is delicious and especially refreshing after the steep hike back up from the tunnel. Think of it like hiking down the Grand Canyon. It's easy enough going down (and it's very cool underground), but then you have to walk back up. Our next stop was Dora Observatory. Here's another example of the unification thing. You never know. It could happen. 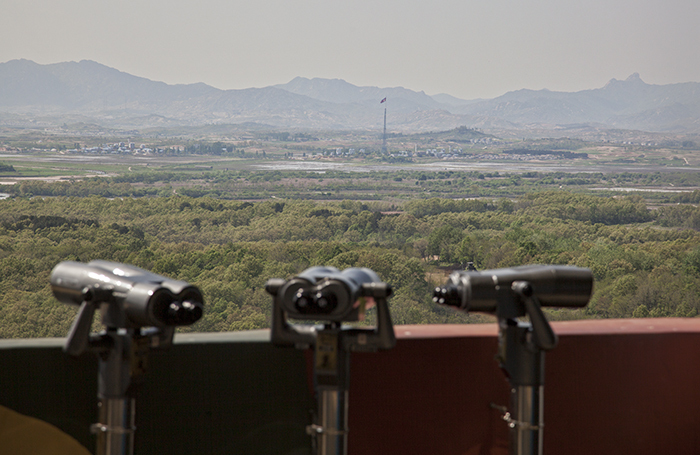 Dora Observatory has a great view into North Korea and their obnoxiously tall flag. At one point, South Korea built a 100m tall flagpole. In response, North Korea one upped them by building the 160m one you see here. At the time, it was the tallest in the world. The only thing about Dora Observatory is that they don't allow picture taking past this "photo line." They are very strict about it too. That's why I was so far back when I took the photo above. 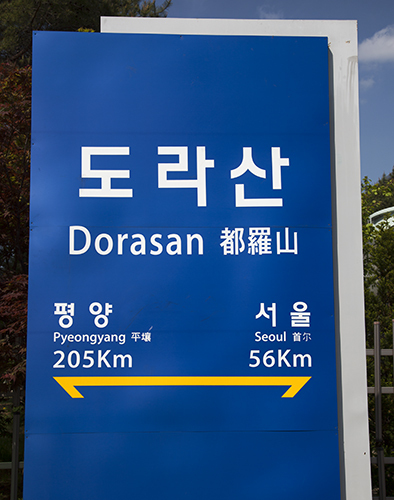 Just below Dora Observatory is Dorasan Station (도라산역). 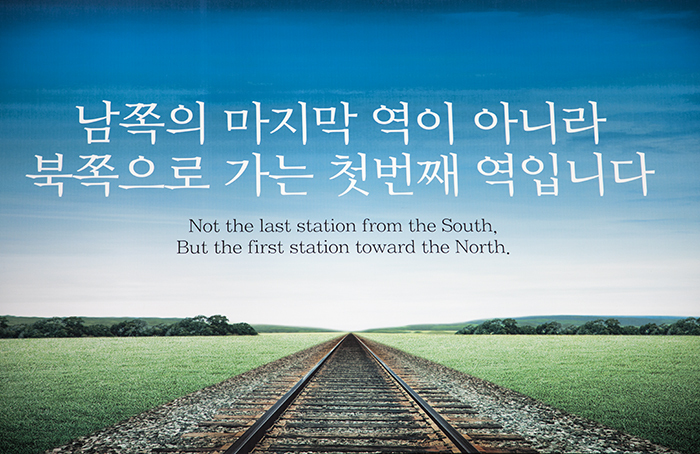 It's the northern most station in South Korea. But don't call it the last station. Here's that hope theme again. 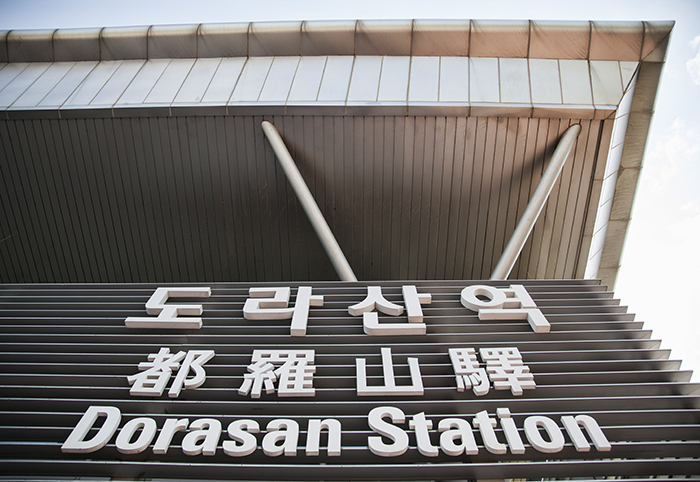 Dorasan Station was built entirely from donation money. It's meant to be a gateway of sorts. 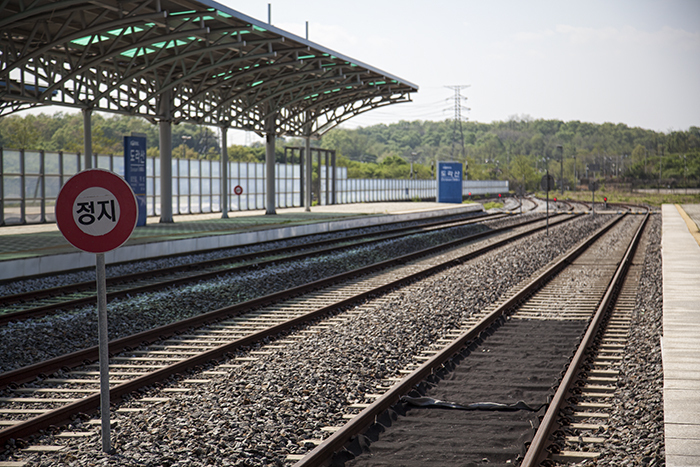 Once the two sides are reunified, trains will start flowing through Dorasan again. Only 205 km to Pyeongyang! Stop! 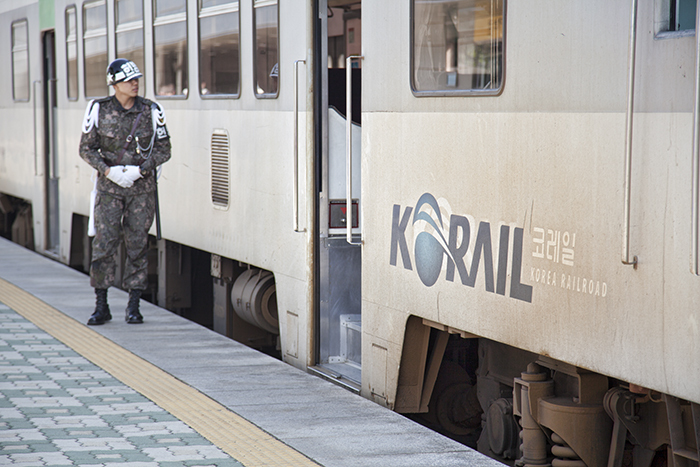 Currently, trains terminate at Dorasan. Obviously, the hope is that they one day continue farther north. From what I understand, the only people on these trains are the commuting workers in the area. Enough of Dorasan. It's finally time to see the JSA! In order to do so, we had to get off the Koridoor bus at Camp Bonifas, sit through a briefing from some US soldiers, and then get on a US Army bus. For the hour we were in the JSA, we were in the hands of the United States military. And here is the JSA. I hope it wasn't too anticlimactic for you. Trust me, it was the highlight of my day. On this particular day, the North Koreans were doing some sort of construction. As a result, they had way more KPA soldiers than usual. And as a result of that, we weren't able to go inside the UNCMAC building. Normally, you can enter the building and have one foot on either side of the MDL. I'm OK with not stepping foot in North Korea. I was happy to see more soldiers to photograph. That's the whole reason I wanted to visit the JSA. Again, it's all because of that movie. The ROK is very strict about how you are allowed to take photos. 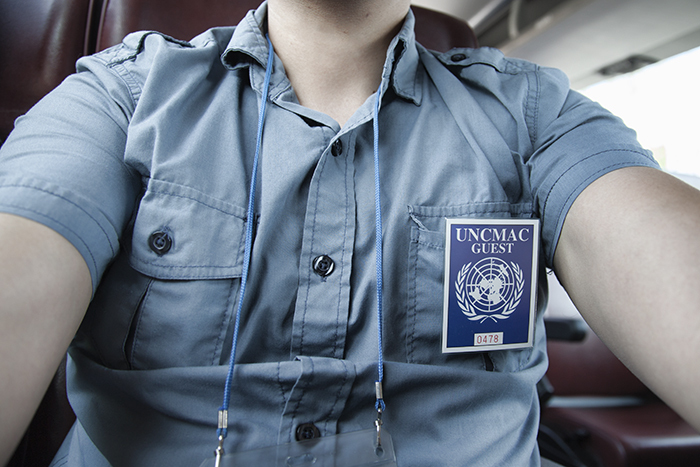 In a nutshell, we were only allowed to photograph in the direction of North Korea. Strange rule, but that was perfectly fine with me. 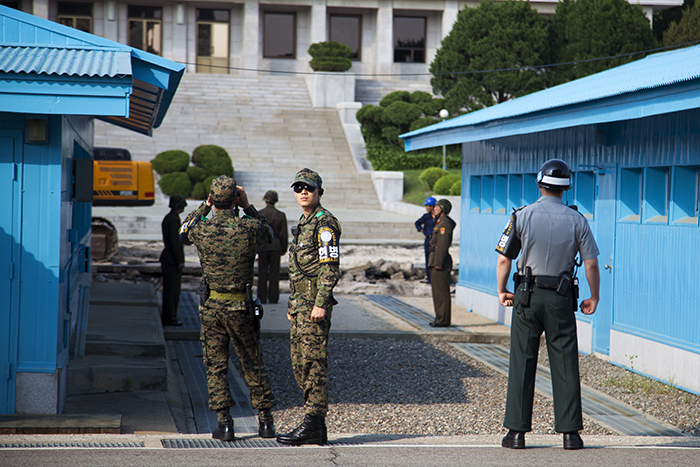 The ROK soldiers in the helmets are standing in a modified Taekwondo stance. They face and watch the enemy at all times. In comparison, the KPA soldiers face each other. People joke that they do so in case the other soldier tries to defect. After seeing the famous blue buildings, we got a closer look at that huge North Korean flagpole. 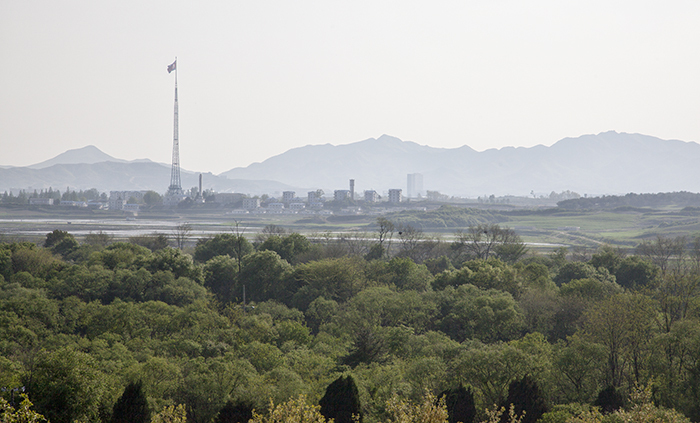 From this vantage point, it was easy to only take photos in the direction of North Korea. This is because North Korea was in front of us, as well as to our left and right. We were surrounded. We survived! Our last stop was at this restaurant where we had Bibimbap (비빔밥) cafeteria style. It was actually pretty good (and not at all blurry in real life). On the bus back to Seoul, they ended up playing the JSA movie on the bus—a fitting end to our tour. As for that Bill Clinton story I mentioned earlier, it goes something like this (as told by one of the US Army Specialists on our tour). Bill Clinton once visited the JSA and he wanted to walk on the Bridge of No Return. The soldiers were reluctant, but they let him do it anyway. So he starts walking across the bridge. And he keeps walking. The soldiers are thinking to themselves, he'll eventually stop and turn around, right? But he keeps walking. Eventually, they had to tackle the President to (1) save his life and (2) prevent him from accidentally defecting. They now call him Wild Bill.